Parrot fish are named for their beak-like mouths, which are full of razor-sharp teeth that can literally shred rock. This adaptation, along with another unusual ability to construct cocoons, allows them to remain in their chosen habitat and never have to venture out in search of food or shelter. Parrot fish are found in tropical waters worldwide. 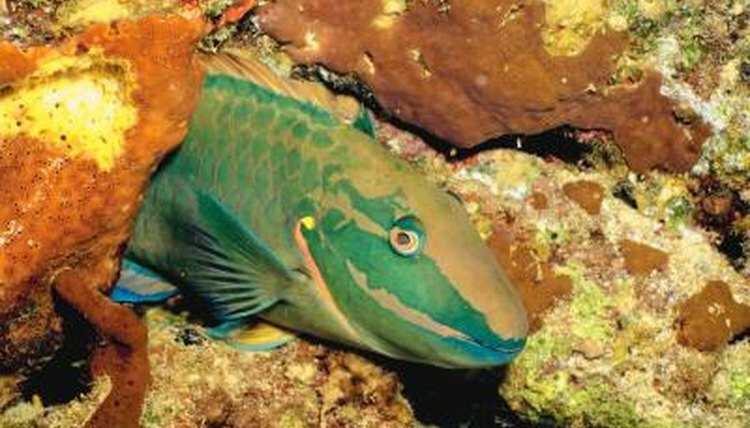 Different species are found in different parts of the world -- for example, the queen parrot fish limits its range mainly to the Caribbean, while the majority of parrot fish species can be found spread throughout the Indo-Pacific, or the tropical waters spreading westward from South America past Australia. The only geographical limitation on the location of parrot fish is temperature, and they are found in warm water regions of the Pacific, Atlantic, Carribean and Indian oceans. Large coral reefs are where parrot fish make their homes. They don't just use the coral formations for shelter, however; they also make them part of their diet. Instead of simply eating the algae off the coral, parrot fish use their sharp teeth to break off chunks of coral skeletons. They ingest the hard pieces along with the algae, process the nutrients from the plants and excrete the coral as fine sand. According to the Shedd Aquarium, larger species of parrot fish, such as the bicolor, can excrete more than a ton of sand in a year. Most parrotfish species prefer shallow water and are typically found in water around 10 feet deep. They will dive much deeper, however, with some species traveling down to around 100 feet in search of food in the coral reef. They will also enter shallow lagoons and seaweed patches. In general, larger parrot fish species live in deeper water than smaller species, who prefer the safety of shallower water. Although they form small schools while feeding during the day, parrot fish are territorial. Each school has a dominant male that defends the territory and chases other males away. The school moves together throughout its territory in the coral reef, feeding on the available algae and then moving on to the next area. The exception to the territorial and schooling behavior are juveniles, who spend their time alone in the coral reef. At night, parrot fish sometimes find crevices or holes in the reef to hide in while they sleep, but this is not a requirement for them to survive in their habitat. If a suitable sleeping place is not available in the reef, some species of parrot fish will construct a bubble-like cocoon for sleeping. They excrete mucous from their mouths until they are ensconced in protective bubbles, which shield them from sharp coral and rocks while they sleep and also deter predators who cannot smell the parrot fish through the layer of mucous.